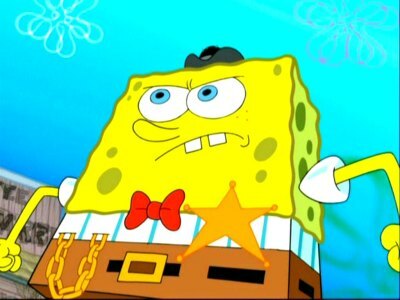 While researching his family tree, SpongeBob discovers he was related to Western hero SpongeBuck. 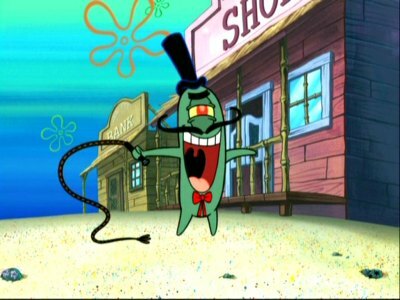 Flashback to SpongeBuck arriving in Bikini Gulch around 1882 and going head-to-head against dastardly Dead-Eye Plankton. Out, out darn spot! SpongeBob refuses to leave work until he gets a stubborn spot off one of the dishes. When Patrick eats his weight in Krabby Patties without paying, Mr. Krabbs puts him to work. SpongeBob mistakenly boards a boat hauling inmates to prison. But being SpongeBob, he can have a good time anywhere, with anyone! Sandy tricks SpongeBob and Patrick into attending survival-training camp, where the creed is "eat or be eaten." SpongeBob and Patrick discover an old submarine, and Mr. Krabs talks them into using it to take the Krusty Krab on the road! It's well-groomed SpongeBob versus never-washes Patrick. In this battle, will SpongeBob clean up or will Patrick resort to dirty tricks? Thanks to dvdtalk.com for pictures, episodes, and descriptions. 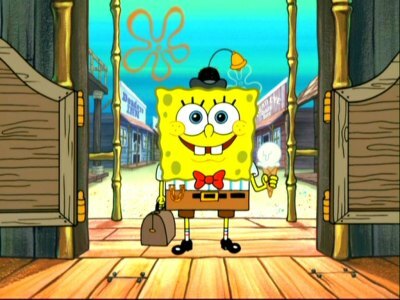 go to www.yahoo.com and be a good boy and girl like Spongebob Squarepants. What do you lack in life to spam like this? Just a review?? Hey i've got Pest of the West last year. This is a episode in season 5. I like the "Idiot Friends" song, it sounds very funny!